Like many great Brewers stories, Bob Uecker was there. It was a sunny afternoon in 2016 when Corey Ray went to take his first swings as a Brewer, trotting past the onlooking icon to the third-base side of the batting cage at Miller Park. The club drafted him fifth overall two weeks earlier and Ray stepped in, watched a pitch sail outside, then treated the rest of the exercise like a personal Home Run Derby. The scheduled tilt against the Nationals became an afterthought as the sound of baseballs slamming into the right-field seats pierced through the Luke Bryan song blaring over the stadium speakers. Brewers farm director Tom Flanagan hadn't caught the live show, but he remembers his phone lighting up with texts and calls relaying Ray's raw power. "His inaugural BP session … it was kind of legendary for the guy," Flanagan said. The impressive showcase, immortalized in the video archives of the team's Facebook page, was uncharacteristic of Ray's style of play to that point. He hit 27 homers over three years at the University of Louisville while compiling 82 stolen bases, including 44 his junior season. The now-24-year-old has maintained his reputation as a speedster in the professional ranks, swiping 71 bags in 307 Minor League games. Power was slower to come as he delivered 12 homers over his first two Minor League seasons. Last year, however, was a different story -- his first year with Double-A Biloxi looked more like that first day at Miller Park. The Chicago native matched the entirety of his college homer output over 135 games, and his stolen base prowess was unaffected by the uptick in power. He swiped 37 bases, his highest single-season total as a pro. Ray also was an incredibly effective basestealer, successfully converting all but seven attempts (84.09 percent), the highest rate among all Minor Leaguers with at least 20 tries. Power and speed -- for Ray, they go hand in hand. "Most of my power comes from the ground up," the 6-foot, 190-pounder said. "Obviously, the stronger your legs, the faster you'll be able to run. I think it correlates very well with me because I put so much emphasis on my legs. "I may not be as tall as all the other guys, but I think I have some pretty strong legs." There's a statistic developed by Bill James in 1980 called the Power-Speed number (PSN), which aims to average home run and stolen base totals. In 2018, no player in the Minors -- and only one player in all of professional baseball -- had a higher PSN than Ray. The importance of this number -- calculated by 2*(HR*SB)/(HR+SB) -- is easier to put into context when judged by the star power atop the Major League list. There were only 11 players in both the Minors and Majors with at least 18 homers and 18 stolen bases last year. At the Major League level, the list of 11 includes both league MVPs, Mookie Betts and Christian Yelich, three of the six other MVP finalists -- Javier Baez, Jose Ramirez and Mike Trout -- and Trevor Story and Francisco Lindor, both of whom received MVP votes. The 11 Major Leaguers with 18/18 seasons make up the top 11 of their respective PSN rankings, but the Minor League PSN numbers paint a different picture. There were 12 players who did not register at least 18 in both categories but posted a higher PSN than Brewers prospect Troy Stokes Jr. and A's prospect Skye Bolt (19), both of whom finished with 19/19. Of those 12, five posted better marks than Rays infielder Nick Solak (19/21, 19.95). Astros prospect Ronnie Dawson had 16 homers and 35 stolen bases, which is good for a 21.96 PSN, better than fellow Astro Kyle Tucker (24/20, 21.82) and Mariners prospect Dom Thompson-Williams (22/20, 20.95). Ray tops the Minor League list with a 31.22 PSN -- identical to Story (37/27), who finished second in the Majors behind Ramirez (39/34, 36.33). Ray's 2018 PSN is the third-highest in the Minors over the past five seasons. Reds prospect Jose Siri finished with a 31.54 in 2017, and Dodgers outfielder Joc Pederson had a 31.43 mark in 2014. It may seem strange to judge a homer, where at least one run scores automatically, evenly with a stolen base, an act that does not guarantee scoring, though it does improve the chances. But the players who can excel in these two specific areas are standouts in the sport. In other words, it's a good strategy to find players who can do both. 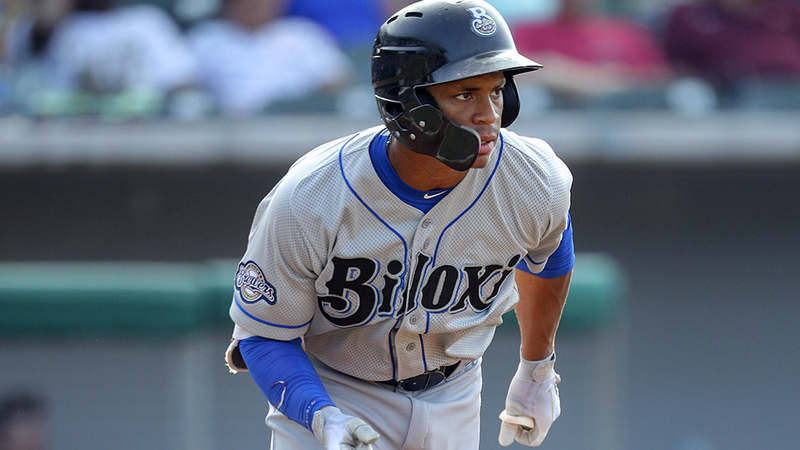 Ray played all but four games out of the leadoff spot for the Shuckers last season, but his offensive numbers didn't fit the profile of a prototypical top-of-the-order bat. He batted .239 with a .323 on-base percentage and 176 strikeouts. He also had seven triples and racked up 32 doubles, meaning almost 52 percent of his hits went for extra bases. It was the fifth-highest mark in the Minors among players with at least 100 hits. Of the four players ahead of him, only Dodgers prospect Jared Walker had any experience as a leadoff hitter, and it was only 13 games. Despite sporting a line that reads more like a middle-of-the-order bruiser than a front-line table-setter, Ray isn't changing his approach to a modern view that puts a premium on increasing launch angle. This way of thinking falls in line with Flanagan's philosophy that developing power is simply a byproduct of strong bat-to-ball skills. "For us, it's more important, not so much what his [strikeout] total is, but how is he getting there?" Flanagan said, explaining that Ray's strikeout totals aren't as daunting as they seem. "Is he aggressive in the zone? Is he swinging at strikes? … Some guys can auto-take pitches. I don't think Corey does a lot of that. I think he's seeing the ball and making his swing decisions accordingly." Ray felt he went through the season with a strong command of the strike zone but was a bit too selective, laying off pitches in the zone that he felt he "could do major damage to." He said this often led to him falling behind in the count, where his two-strike approach also needed major improvement. "My hitting coaches, we were trying to figure out a way that could actually make more contact," said Ray, who's worked with Brewers hitting coordinator Kenny Graham this offseason. "I'm happy with the home runs, but I want to be a guy that, if I can hit .300 I want to do it -- despite how many home runs I hit." Flanagan said Ray has time to sort out these issues, likely with Triple-A San Antonio for the bulk of 2019. But before the season starts, the Chicago native can prove himself at Major League Spring Training. He got his first invitation to big league camp on Jan. 16, a milestone for Ray, regardless of when he ends up afterward. He was discouraged after not receiving an invitation last year. He gutted it out for 112 games with Class A Advanced Carolina in 2017 while working his way back from a nasty injury sustained in the instructional league in 2016, tearing cartilage in his left knee while sliding. "I had worked so hard to get back and I had worked so hard to strengthen my leg and I had worked so hard to try and contribute to my team's winning, and it just didn't work out," he said. "We as people, and we as competitors, we just expect our hard work to pay off immediately." Now fully healthy and looking to prove he belongs in the Majors, Ray has three giant road blocks awaiting him in Milwaukee. Not only do the Brewers employ perhaps the most complete outfield in baseball, but each player has thrived at Ray's own game. Yelich, the reigning National League MVP, posted a career-best 27.31 PSN last season after hitting 36 homers and stealing 22 bases. Lorenzo Cain, who mans Ray's would-be post in center field, totaled 30 steals for the first time at the Major League level, just three years removed from his highest 20.36 PSN with the Royals in 2014. And Ryan Braun, the 2011 NL MVP, has finished in the top 10 in PSN four times in the past 12 years. The entire outfield is under team control until Braun's deal expires in 2021, with Yelich and Cain due to hit the market in 2023. There's a stone wall in Ray's path to the Majors, but some cracks began to form this offseason. The club traded Domingo Santana to Seattle in December and Keon Broxton -- another player with power-speed potential -- to the Mets in January. "The only thing I can control is the numbers I put up and the work I put in," Ray said. "I think that naturally, you see those are guys that were ahead of you [get traded] and you're glad that some things are opening up. But it doesn't really matter if things are opening up if you don't put up numbers." Despite any potential obstacles, Ray's camp invitation was not the only vote of confidence he's received from the organization. The Simeon Career Academy graduate was named the Brewers Minor League Player of the Year, earning a trip back to Miller Park to be honored before the Sept. 28 game against the Tigers. Brewers outfielder Curtis Granderson did not get in the game that day. Also a Chicago native, Granderson had developed a mentor-like friendship with Ray long before he was acquired from the Blue Jays last August. On the field, he provides a strong profile of the type of player Ray might strive to be. Granderson's best PSN output was 31.06 with the Yankees in 2011, and he also hit 26 homers out of the leadoff spot on the NL pennant-winning Mets in 2015. "We never talk about mechanics. … I think he just goes and he lets me be me," Ray said. "He lets me do whatever it is that I need to do mechanically that I feel works for me. His big thing is to just be comfortable. Everyone is different. … He's not trying to turn me into him." Off the field, Ray and Granderson are already in sync, and they've maintained that friendship. The pair hosted the Dream Weekend, a baseball camp in three Mississippi communities -- Hattiesburg, Gulfport and Jackson -- during the Dr. Martin Luther King Jr. holiday weekend. Ray said they rarely talk about baseball, even when they became part of the same franchise after the trade. "I wish we could have got him a ring, but we fell a little short," Ray said.